- CHINE – Xiangtangshan - An unfinished Buddhist scripture dating to around 386 A.D. has been found engraved on a cave wall. Archaeological workers discovered the scripture in northern China's Hebei province. The scripture - named the Lotus Sutra - was found in a cave in Xiangtangshan region, an official said. It is believed to have been created during the Northern Dynasties (386 to 581 A.D.), but was not finished, the official said. 'We'll probe into the reason why the work was halted,' he added. The Xiangtangshan area includes 16 caves and over 450 cliffside sculptures. It came under state protection in 1961. - USA – Annapolis - An archaeological team from the University of Maryland is uncovering an unexpectedly rich haul of household materials from an historic African American home in Annapolis – with one more week to go in their excavation. The team is working at the James Holliday House in Annapolis – a middle class home purchased in 1850 by one of the first African Americans to work for the U.S. Naval Academy. They say their finds detail how a well-off African American family adapted a middle class lifestyle to the realities of post-Civil War Annapolis. Also, they are exploring the family’s marital ties to the city’s Filipino community. James Holliday – born a slave in 1809 and freed in 1819 – served as a messenger to the superintendent of the U.S. Naval Academy for almost 40 years. He took the job in 1845, and five years later bought the home at 99 East Street in Annapolis. - INDE – Thalachangadu - A team of archaeological experts have unearthed a tenth century stone engraving belonging to the Chola era at Thalachangadu village in Nagapattinam district. The team also found semi precious stones, burial urns and lamps at the site located inside the panchayat union middle school at Thalachangadu at a depth of 13 feet. The finding has established that the ancient port town of Poompuhar had extended till Thalachangadu. Thalachangadu is about eight km from Poompuhar, a flourishing coastal trade centre that submerged later. The stone engraving belonged to the period of Parantaka Chola I. Besides, another stone engraving belonging to Naik period installed in 1825 was also found. Close to the site where the stone engravings were excavated, the team found a burial urn in a broken state, a lamp, sea shells and semi-precious stones. "Poompuhar, a centre of Tamil civilization had extended till Thalachangadu. Historic evidences like the stone engravings and the semi-precious stones found during the month long excavation exercise have established this fact," said G Muthusamy, curator of Tharangampadi government museum, who was part of the team. In August last year several articles dating back to the 10th Century Chola period were unearthed by archaeologists in Sembianmahadevi and Pappakovil villages also near Poompuhar. The articles, including a big wooden paddy measure called `marakkal' and three big clay oil containers, believed to be made in China, were found by an archaeology team. 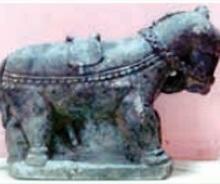 - INDE – Kalya - S A Krishnaiah, folklore scholar, and Prof T Murugeshi, professor of MSRS College Shirva in the department of history and archaeology, said that a very rare unicorn sculpture of ‘Hayagajanandi (combination of horse, elephant, bull), has been found from Nagabrahmasthana at Kalya near Nitte in Karkala taluk. They were addressing a press conference here on Monday June 13. This stone sculpture is claimed to be one of the rarest of the unicorn icons found in India. The hind and front left legs of the sculpture have been damaged. The right front leg clearly resembles that of an elephant. The hind leg is like those of the bulls, with hoof at the tip. The tail of the icon is like that of the bull instead of horse. The sculpture has the face of a horse, and a part of the face has been broken. A single horn standing at the centre of the sculpture's head, is in broken condition. An artistic chain with tiny jingle bells joined together adorns the body of the sculpture, and a saddle is carved atop its back, while another attractive chain has been looped around the neck and face of the sculpture. This unicorn sculpture happens to be the vehicle of Bermeru Daiva (demigod) of the Nagabrahmasthana. In Tulu folklore, the demigods riding horse or such other animals are identified as ‘Bermeru’ or ‘Jaina Bermeru’. The sculpture now found, which is an imaginary animal created by creative artistes, is said to be the first of its kind in the country. The sculpture is estimated to be belonging to the 12th or 13th century AD. The sculptures with features of different animals represent fertility, Prof Murugeshi said. - BANGLADESH - Panchagarh Sadar Upazila - The High Court has asked the government why the seventh century fort-town at Panchagarh Sadar Upazila should not be declared an archaeological site.The court asked also why directive should not be given to preserve that historical establishment of Bhitargarh Mouza. The court asked nine people, including the cultural secretary, land secretary, director general of archaeology department, Panchagarh deputy commissioner (DC), district police superintendent (SP) and Panchagarh Sadar Police Station officer-in-charge to reply within three weeks.